Design of clubhouses and other sports buildings – Fully project managed service! Our approach gives our clients the very best chance in achieving funding success! We’ll deliver all the surface types you require! Established in 1992, Club Design Ltd is a company that specialises in the design of new sporting facilities, project managing from initial thoughts through to completion. The company has become very experienced in dealing with all aspects of facilities development, starting with sensible and attractive designs, through to planning applications, dealing with funding issues, detailed specifications, costing and budgeting, tender action and site works. 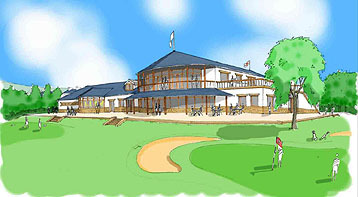 Design of clubhouses and other sports buildings. We offer full project management and an expert approach to planning issues with a high planning success rate. It is important that a need for funding is clearly identified and that a structured plan is put into place to deliver. We give our clients the very best chance in achieving funding success. Club Design Ltd has successfully managed the relocation of many sporting organisations. Many clubs can sometimes relocate to a new site using the land sale to fund a fantastic new club. Natural turf surfaces, including new cricket grounds, football & rugby pitches. Artificial cricket net practice areas, tennis courts and 3rd Generation football and rugby pitches.